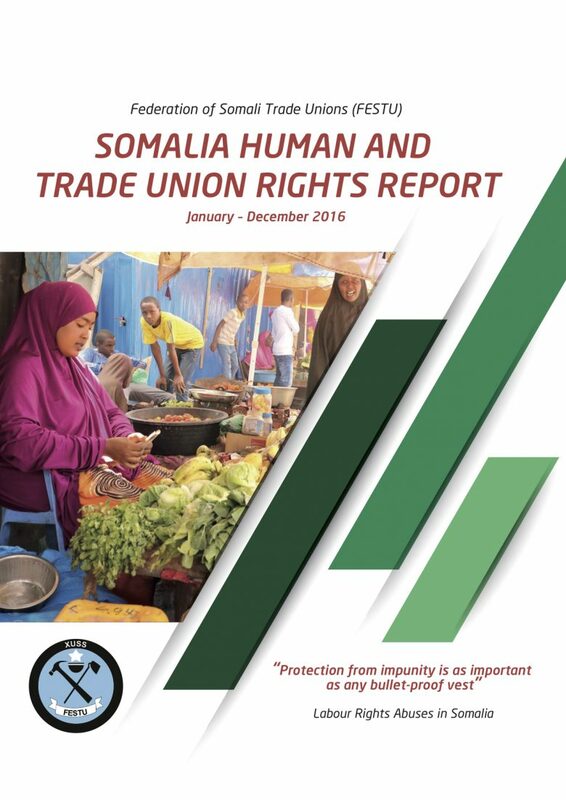 The Federation of Somali Trade Unions (FESTU), umbrella organization of eleven independent and representative trade unions of Somalia, joins hands with all progressive organizations and trade union movement to support the global campaign to eliminate violence against women. FESTU is appalled by the rising levels of violence and the increasingly heinous acts that are unleashed on women in our society. This scourge has been concentrated in the working class communities; but we note how all classes are affected by gender-based violence. In Somalia, women are regularly and brutally assaulted, raped and even murdered. As well as the physical impact this has a massive mental and psychological impact on those affected. Sexual harassment and the violence against Somali women that is inherent in it is not taken seriously – not by the employers (bosses), not by the law enforcement, not by society in general. A more widespread problem is that the majority of women lack economic independence. The high levels of unemployment which deprive millions of women of the chance of a job and an income, or at best restrict them to low-paid, insecure jobs make this problem even worse. Women have quality jobs and their salaries and working conditions are raised to a level that allows them to live independent lives. This federation and its 11 member unions are committed to fight these injustices tooth-and-nail. We insist that violence against women is always illegal, always wrong and always a violation of the fundamental human right to live in safety and security. We will never be able to claim victory in the struggle for social justice and respect for human rights so long as Somali women are being battered, harassed, intimidated and denied their constitution rights. Somali nation cannot claim to be civilized while such daily assaults on our most vulnerable fellow human beings continue to happen in our workplaces, houses and streets. All other human rights are insignificant if women are denied the most basic right to personal safety. Patriarchy and unscrupulous entrepreneurship are bed fellows. Inequality and discrimination of certain groups and women are the order of the day. FESTU calls for a speedier shift to an egalitarian society where all individuals and groups will have rights and be respected and we can live in peace. We will fight for an end to poverty and economic oppression of women. We will fight for an end to violence and abuses against women. We will fight for economic and social justice across the country. We call on our trade unions, businesses and governments (both federal and State levels) to ensure that women live in a violence-free society. All of us need to educate our members about the rights of women as well as how to deal with these incidents and how to ultimately eradicate them from our society. This ugly situation needs to be reversed and this kind of violence must be stamped out of our society. FESTU joins the International Trade Unions Confederation (ITUC) in campaigning for a new international labour Convention to tackle the various forms of gender-based violence that occur in the world of work. Down with the oppression of women! Forward to a peaceful and egalitarian society!